River Deep Mountain High is owned and run by Johan and Emma Hoving. We feel that the world of outdoor activities when served up with quality equipment and service, is a pleasurable active way to enjoy the beautiful landscape we are blessed with living in the midst of. We aim for high quality and try to deliver this throughout. We have chosen equipment that makes for the most pleasurable ride. Our clothing is easy to put on, comfortable to wear when taking part in activities and doesn’t feel like thousands of people have worn it before you. We've also added in services such as one-way journeys on lakes to make the most of the wind and one-way biking journeys to enjoy the downhill trend. We don’t expect you to notice all these things when out with us, we just expect you to enjoy the experience without distraction. 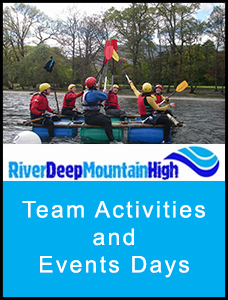 Team activities in the Lake District with River Deep Mountain High are based on the idea that outdoor activities in our beautiful landscape offer a great team development experience with many tangible benefits for you and your team. And if you simply want to enjoy a great team activity our prices will keep it achievable in your budget, with a simple 2 hour activity starting from as little as £250 per team. 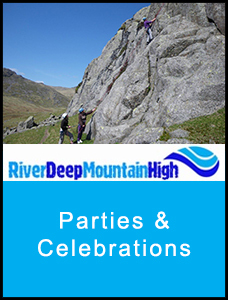 There are plenty of ways River Deep Mountain High could make your event, meeting, conference or away day into a fun, memorable experience. We’ve tried to explain some of them here but feel free to just give us a ring and discuss your requirements - we’re a small team who love sharing our knowledge and enjoyment of the outdoors. 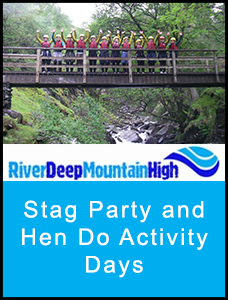 Outdoor activities are brilliant fun and get children and young adults enjoying the outdoors! Outdoor adventure sports are a great way to encourage confidence and understand team and group dynamics in the great outdoors! Our youth group activity sessions aim to be energetic but pitched at a level to suit each particular group. We have provided outdoor activities for Scout Groups, Peer Support Groups, Sport Teams and for Charity Groups such as the NSPCC. We understand that schools and youth groups are often working within tight budgets but also want to give their members a fantastic experience to remember. For this reason we have a specific pricing structure to help things along. Anyone can celebrate that special occasion with a glass of bubbly and a good meal with family and friends, but how about giving everyone a really amazing memory to share. Whether you are approaching a milestone birthday, having a family reunion or merely celebrating that it’s the weekend, we can help you find the right activities for your group. We are also happy to help you arrange more specific details for your day from a fantastic picnic at the ‘top of the world’ to a fireside afternoon tea at a local country house and in 2009 we even had our first engagement followed by champagne on a gorge walk. We are happy to discuss any ideas you may have for your celebration activity day and below are some ideas to help get your little grey cells working.